We added a pedestal dripper to keep the bird bath full and attract more birds. We were so excited that our first customer was the female hooded oriole! 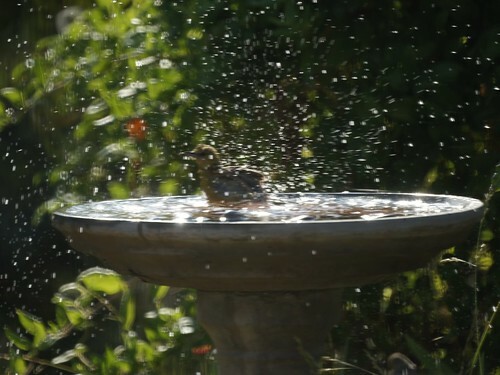 There is at least one pair of hooded orioles in the yard, but we hadn't seen them drink or bathe before this time. That little device was worth every penny! Not having so much luck with another bath and a solar fountain, but Chris loves to tinker with projects so maybe that one will work out well too.